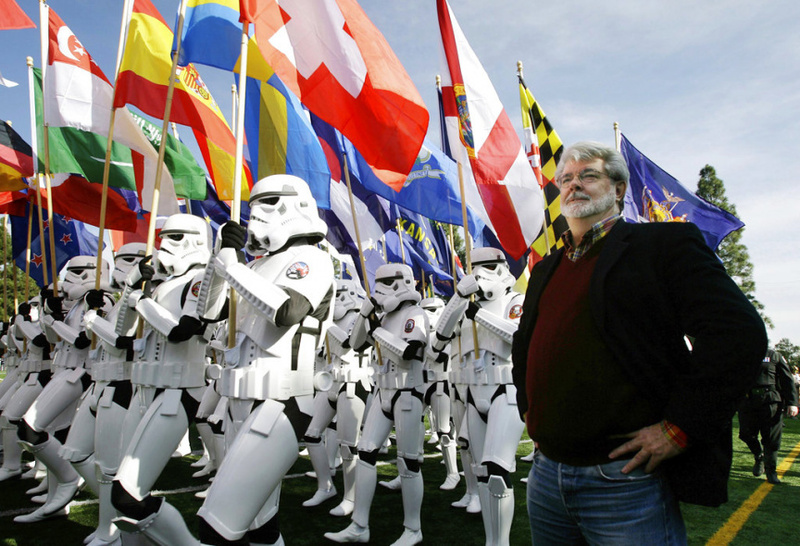 LOS ANGELES (AP) — "Star Wars" creator George Lucas is visiting a galaxy on the edge of downtown Los Angeles to break ground on his $1.5 billion Lucas Museum of Narrative Art. The institution, scheduled to open in 2021, is envisioned as not just a repository for "Star Wars" memorabilia but a wide-ranging museum representing all forms of visual storytelling from paintings and drawings to comic strips and digital and traditional films. The latter will run the gamut from 1927's futuristic masterpiece "Metropolis" to Orson Welles' groundbreaking 1941 film "Citizen Kane" to the Lucas-Steven Spielberg collaborations on the "Indiana Jones" movies. Of course the Force will also be strong with "Star Wars" stuff, including Luke Skywalker's first lightsaber and Darth Vader's helmet. But, Lucas emphasized when the City Council voted 14-0 to approve the project last year that the Lucas Museum for Narrative Art is hardly intended to be a vanity project. Its wide-ranging collection will also include paintings by Norman Rockwell, Edgar Degas and Pierre-Auguste Renoir, comic strips by "Peanuts" creator Charles Schulz and underground artist Robert Crumb, animation from films such as "Who Framed Roger Rabbit" and special effects from films such as "E.T. the Extra-Terrestrial." "The idea is that it's popular art, it's art that appeals to people emotionally and tells you something about who you are," he said. The museum's construction and endowment is being funded entirely by Lucas, his wife and their foundation, which Los Angeles officials say makes it the largest public gift ever given to a municipality. Schematic drawings show the building, with about 100,000 square feet (9,290 sq. meters) of gallery space, looking a good deal like a version of Han Solo's Millennium Falcon spacecraft as it appears to hover above a section of Exposition Park near downtown. It will be walking distance to the Natural History Museum of Los Angeles County, the California Science Center and the University of Southern California, which is where Lucas studied cinema before launching his career with the acclaimed 1971 science-fiction film "THX 1138." Plans are to offer programs for schoolchildren explaining the history of narrative storytelling with the hope it will inspire them to become their own generation's storytellers.